Sticking to what it knows best, SS20 Fish Head Noodle restaurant keeps customers a-slurping. IT says something when a small informal eatery finds its way into the travellers? review website Tripadvisor and quite a few local food blogs. On a Sunday afternoon, there were people waiting for tables, and the inside of the restaurant was full, although it was quiet outside, since the block of shops is in a residential corner of Petaling Jaya. The restaurant serves essentially a single dish, or permutations and combinations of it, with the restaurant name, SS20 Fish Head Noodle, alluding to it. The main dish here is fish with noodles in soup. The menu is simple with just three main offerings: soong fish with noodles, haruan fish with noodles or fish paste with noodles. Given a choice of three noodle types ? fine mee hoon, lai fun and thick mee hoon, and another choice of the fish being fried or non-fried, except for the fish paste, that works out to be 15 permutations of fish noodles. 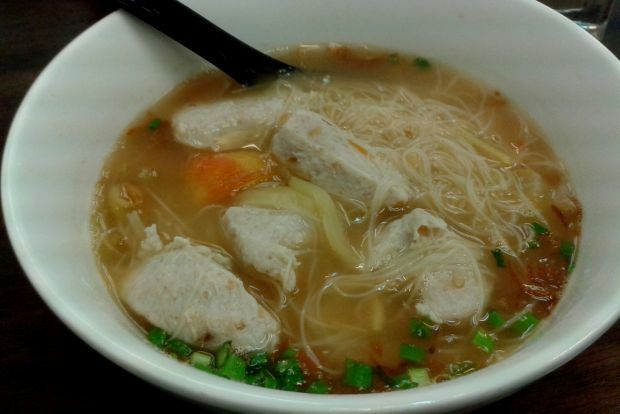 Add in the fact that the fish soup can be had with or without evaporated milk added, and the seemingly simple menu has 30 possible permutations of fish noodles in soup. There is only one serving size, priced at RM11 for the fine mee hoon with either soong or haruan fish, and RM12 for the same dish with lai fun or thick mee hoon. The fish paste servings are priced at RM9.50 for fine mee hoon and RM10 for lai fun and thick mee hoon. The meat of haruan, a carnivorous freshwater fish, is firmer than the bonier soong fish, and the fish paste is made from haruan meat, but it?s a matter of personal taste. Similarly, lai fun is a smooth, round, thick noodle, while the mee hoon is coarser in texture so the noodle choice is also a personal preference.